Its hard to believe I’ve already been back for a month. God has been working all around me and I’ve been so caught up in Him, the time has just slipped away. I have a wonderful Arafat update for you. He is truly better….here is a new picture for you. 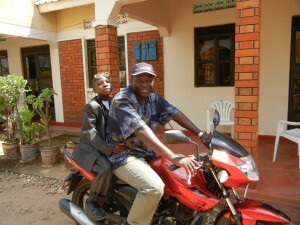 Pastor Moses took him for a ride on his motorcycle! He loved it….I asked him was it more fun to ride one than be hit by one and he laughed! Its been over three weeks now since he has taken anything for pain. He is no longer in the bed for hours during the day, he gets up early and stays up all day. His wound in now about the size of a quarter….a miracle as for the previous 6 months, it was often the length of a dollar bill. All of his body functions are working properly and he is happy and playing all the time. Sometimes I forget how much better he is and it shocks me to see him walk by the window laughing and playing with our other children here. God has blessed us with a miracle. There is no other explanation as to why he is still alive! The best part of the update though is this. The first week I was back he and I were sitting together just talking about random things. Out of nowhere he said….I’m a Christian now and I want to be baptized! My heart was thrilled…..for a child from a Muslim background to accept Jesus as his Savior and on his own share his desire for baptism is just as much a miracle as his healing has been. Please take some time when you read this and thank God for the miracle He has sent. I have two prayer request I’d like you to pray. I have a good friend in my bible fellowship class at Blackshear Place, Donna Gabriel. She has recently been diagnosed with cancer. Her and her friend Melanie, both of whom are nurses have been planning diligently to come here on a mission trip and possible make a decision to stay here fulltime. I would like for you to pray for God’s divine total physically healing so some day soon she can make the journey she’s been planning. Another request is: there is a mission team leaving out of Atlanta today from my home church, Blackshear Place headed over here to serve. Please pray specifically for their safety and for this trip to deepen their relationship with the Lord in such a way that they will never be the same again. Praise God! I am crying right now as I thank God for Arafat’s healing and his salvation! God will receive ALL glory forever! The Life and Mission of Joy Breedlove is powered by	WordPress 3.4.2 and delivered to you in 0.144 seconds using 36 queries.